20 Apr 2018 – This article was originally published in 2014. The data has changed but will not be available until further studies are concluded. Iraq was the fertile crescent of antiquity, the vast area that fed the entire Middle East and Mediterranean, and introduced grains to the world. It was Mesopotamia, the cradle of civilization, which propelled us forward with its invention of writing, domestication of animals and settled life. Now its groundwater and soil store the radioactivity of 630 tons of depleted uranium weapons. The waste that has been thrown onto civilian targets has permanent consequences. It pollutes southern Iraq, Kuwait and Saudi Arabia with uranium oxide dust that spreads as far as 26 miles, blowing with sand, weathering into water. Uranium 238, with a half life 4 ½ billion years, lies on the region in the scattered tons of wreckage. Contamination is permanent. Its radiological and chemical toxicity exposes the population to continuous alpha radiation that is breathed into lungs, absorbed through the skin, touched by the unwashed hands of kids who roam the scrap metal yards for parts to sell to help their families. Depleted uranium is a waste product of the process used to make nuclear power reactors. 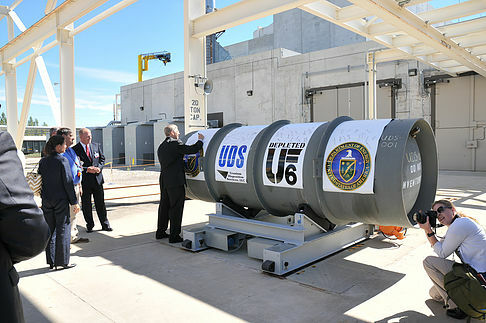 A heavy radiological metal of high density, it is used as the core of armor piercing munitions, and is incorporated into vehicles that become almost impervious to penetration by conventional rounds. Tanks, attack jets, helicopters and missiles routinely use DU rounds. DU is self burning, and when it hits a hard target aerosolized particles are released in high concentrations as toxic smoke. In the 1970s DU was given free to arms manufacturers and governments for study, eliminating the high costs of long-term storage and monitoring. Most DU research is performed by military, industrial and government organizations with a vested interest in its continued use. A UN Sub-Commission on Human Rights has condemned depleted uranium munitions as weapons of indiscriminate destruction. Its effects continue after war ends and beyond military objectives; particles travel to noncombatant countries, polluting soil, water and food. In 1996 the UN passed a resolution to ban the use of DUs. The US voted no, and all abstentions were from Europe. 1991 witnessed the first firing of depleted uranium weapons by the US and Britain. 87,500 tons of bombs were dropped on Iraq and Kuwait, more than the atomic bomb that incinerated Hiroshima. Tons of armor piercing weapons were fired from 14,000 tanks, 50,000 missiles and rockets. The Air Force fired a million rounds. Seventy percent of the munitions did not hit military targets, and indiscriminate force resulted in civilian deaths, 90% who were noncombatants. 50,000 children died in Iraq from DU weapons early in the Gulf War. Battle sites that were overwhelmingly residential and urban continue to emit disproportionately high concentrations of radioactive elements. A child hospitalized in Falluja victim of depleted uranium birth defect caused by US invader ammunition. In 2002 the US fired between 300 and 800 tons of DU ammunition on Iraq. In three weeks of the 2003 bombardment, 1000-2000 tons of DU weapons were fired. The US GAO estimates six billion DU bullets were fired between 2003-05. The Persian Gulf has been left with 300 tons of wreckage on the ground, polluting the land and water for decades. Uranium has an affinity within the body for DNA, chemically bonding to it. When human bone cells are exposed to depleted uranium they fragment, breaking away from chromosomes and reforming abnormally, and the mutations are passed from parent to child. 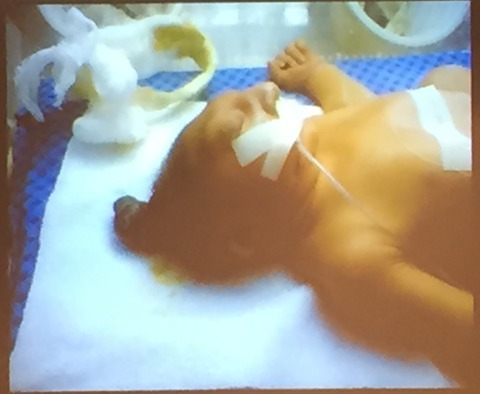 Iraq is experiencing an epidemic of birth defects, sometimes multiple defects in one baby. Leuren Moret, a nuclear authority at Livermore National Laboratory, reveals that so much DU has been fired that the genetic future of the Iraqi people is destroyed. For every defect now, we will see thousands in future generations. Fifty percent of children are born with malformations, and in a few years it can be every one. Iraq is seeing conditions for which there are no medical terms. Birth defects in Basra increased 17 times between 2003-2011. It saw a 7% increase between 1994-2003, six times higher than the rate in the United States. Childhood cancers rose 384% in the ten years between 1990-2000. Fallujah is 40 miles from Baghdad, and after massive sieges it experiences the highest rate of genetic damage in any population ever studied. Birth defects are 14 times higher than those in Nagasaki and Hiroshima. Between 2007-10 half of the babies were born with birth defects. A 2010 study found birth defects 33 times higher than in Europe. Congenital malformations have mushroomed, including nervous system and heart defects. Severe birth defects in newborns appear as multiple disfiguring tumors, overgrown or missing limbs, fused legs. Babies are born with spina bifida, some are missing genitalia, and some are born with their intestines outside their little bellies. The photos are shocking and very painful to look at: newborns with two heads, or no head, scaly bodies, missing eyes or one eye in the center of the face, malformed ears, noses, bones and rib cages rendering the infants unable to live. In September of 2009, of the 170 babies born, 24% died in a week, and 75% of them were deformed. In 2011 doctors reported two babies born with birth defects every day, which is 11 times the world average. During the crisis, hospitals reported new mothers in shock, apologizing for their deformed newborns. Fallujah has suffered an increase in sterility and infertility, and one of every six pregnancies miscarried between 2009-10. Today women in Fallujah are too scared to conceive and hospital officials are quietly telling them to avoid pregnancy. Cancer rates doubled between 1993-2007, as did childhood leukemia, which is epidemic. By 2012, cancers increased three times. Fallujah is unable to have consistently healthy babies. Human Rights Now, a Tokyo-based organization, released a report asserting that the right to health and life of the children of Fallujah was seriously violated. There was an extraordinary rise in congenital birth defects due to environmental contamination which no one investigated. No one was brought to justice. The group calls on the US and UK to disclose information on the quantities, types and firing points of DU weapons. Mosul was the breadbasket for 19 million people. Now weeds and crop diseases never before recorded in their history ravage farmland and date and citrus trees. Bedouins report hundreds of dead animals in the desert including camels, sheep, birds and the insects that cover the remains. Hundreds of thousands of tons of edible wild plants have been contaminated. In a Baghdad shelter in 1994, 800 women and children hid from bombardment. A DU projectile fired by a plane penetrated the walls of the shelter, and every one was killed. The imprints of their bodies pressed against the walls are still visible. After bombardments, populations return to their homes and rebuild on the rubble. They suffer continuous exposure to toxic metals left in the wreckage of tanks, ash and dust, soil and polluted water. It is a health emergency that requires international action to control the damage. The Iraqi government identifies 300-365 radioactively contaminated sites. The US government has failed to release information on the amount of DU it used, despite a UN request. Since the fall of Sadam Hussein, it has forbidden a UN environment program from collecting environmental samples. The US has not investigated birth defects in Iraq. It has failed in its obligation to provide a remedy, restitution or rehabilitation. Its refusal to disclose firing locations hampers cleanup. The Defense Dept. is not aware of any official report indicating an increase in birth defects related to metals contained in US munitions. And the UK asserts there is no reliable scientific or medical evidence to confirm a link to birth defects. The World Health Organization of the UN refuses to share evidence of killed civilians and birth defects in Iraq. Its first report by leading radiation scientists confirmed that children and adults who inhaled DU dust contracted cancers, but the report was suppressed. A report due for release in 2012 was repeatedly delayed, and now no release date is projected and it is labeled “classified.” A former UN Assistant Secretary General states that a study of the reality of DU impact from combat was aborted by US pressure. Between 1994-95 the US and NATO fired 3 ½ metrics tons of DU on Bosnia. NATO, the US and UK flew 4000 aerial sorties over Serbian civilian areas. DU was used on military and civilian targets and in land mines planted around NATO bases. In 1999 more than 10 metric tons of DU rounds hit Kosovo, Serbia and Montenegro, contaminating local supplies of drinking water and soil. NATO left behind 100 known contaminated DU sites in Kosovo. Foreign personnel were warned to stay away, but no one warned civilians. NATO denied its use of DU weapons for five years and during that time no provision was made for cleanup. US aircraft fired 9 tons of DU munitions but did not reveal the information for a year. The local civil population has suffered from the effects of the NATO campaign in the Balkans with increases of miscarriage, premature and still births. Serbia experienced an enormous rise in cancer rates and birth defects. The long term effects on health in southeastern Europe is an international crisis that will affect future generations. It is believed that DU munitions have been fired in Afghanistan. Somalia, Yemen, Libya and Pakistan have been target sites of DU bombings. In 2009 Israel fired on Lebanon and Gaza with DU weapons, and medics found traces of DU in the wounds of bodies. The US, the UK and Israel may have triggered a nuclear holocaust in the Mid-East. Okinawa, Japan, a subtropical island 67 miles long, was fired upon in 1995-96 with DU weapons during routine testing. The Defense Dept. later admitted that “it was a mistake, the shells were mislabeled.” 1000 DU rounds were fired from Marine Harrier aircraft. On the small island of Vieques, Puerto Rico, US aircraft have routinely fired DU rounds in munitions testing. DU has possibly been used for a decade, but the Navy only admits to testing in 1999. A study of Gulf War vets revealed they are three times more likely to have children born with birth defects. Another study reports 50% more physical abnormalities in their newborns, and a 40% increase of miscarriages of their wives. Of 251 Gulf War vets in Mississippi, 67% of the children conceived since the war suffered birth defects, including severe eye defects, no eyes, and no ears. There has been a massive increase of cancers since 1991. 24,000 to 25,000 vets died of Gulf War Syndrome. The Pentagon has denied troop exposure to depleted uranium and instead attributed the deaths to smoke from oil well fires, parasites, pesticides, vaccines, and psychological causes. Black and Latino troops are disproportionately at risk on the front lines, walking through invisible clouds of uranium dioxide. Veterans for Constitutional Law says the long term effect of DU is a virtual death sentence. The Geneva Protocols prohibit warfare methods that cause unnecessary suffering or inflict lasting, widespread, severe damage to the environment. However, the US has not ratified the Protocol. There has been no significant investigation by the UN, US or UK on the health consequences to civilians associated with toxic munitions. Contaminated soil will not be removed or cleaned. No law requires the US to remediate. The US exports depleted uranium to Israel, Saudi Arabia, Kuwait, Bahrain, Turkey, Greece, Taiwan, Thailand and South Korea. There are more than 50 DU production sites, and 24 states are involved in DU research, testing and storage. Arsenals of depleted uranium are stockpiled in the UK, France, Russia, Sweden, Greece, Turkey, Israel, Saudi Arabia, Jordan, Bahrain, Egypt, Kuwait, Pakistan, Japan, South Korea, Taiwan and Thailand. Proliferation is inevitable because it reduces DU stockpiles in countries that enrich uranium. DU will be even more openly available in the world market in the future. Lately Iraqi and British doctors have come forward to campaign the UN for an independent investigation. The Council of Europe has called for ban on manufacture and use of DU, and an EU Parliament Resolution is calling upon member states to propose a moratorium on DU weapons. It is time to heed Einstein’s caution that we require an entirely new pattern of thinking if mankind is to survive.